A blend of pulp poetry and art cinema directed by Georges Franju. Cruel and tender, the story concerns a doctor who is driven mad with guilt because he has disfigured his daughter. As atonement the doctor kidnaps women and peels off their faces, trying to graft them on to his daughter’s ruined features. 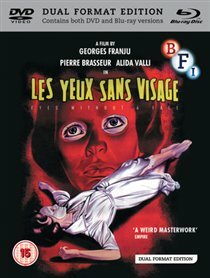 Eyes Without a Face is at once cruel and tender – highlighting Georges Franju’s unique blend of pulp, horror and poetry, it has, in the decades since it’s release, been a major influence on filmmakers such as Jesús Franco, John Carpenter and, more recently, Pedro Almodóvar. • For Her Eyes Only – an interview with Edith Scob (LP Hugo, 2014, 17 mins): the actress talks about her work with Georges Franju and their friendship.